Upright: Courage, confidence, independence, social butterfly, determination. Reversed: Self-respect, self-confidence, introverted, re-establish sense of self. The Queen of Wands sits upon a throne decorated with lions facing opposing directions, a symbol of fire and strength. In her left hand, on her crown and behind her are sunflowers, symbolising life, fertility, joy and satisfaction, and her right hand holds a wand with one small sprout springing to life. 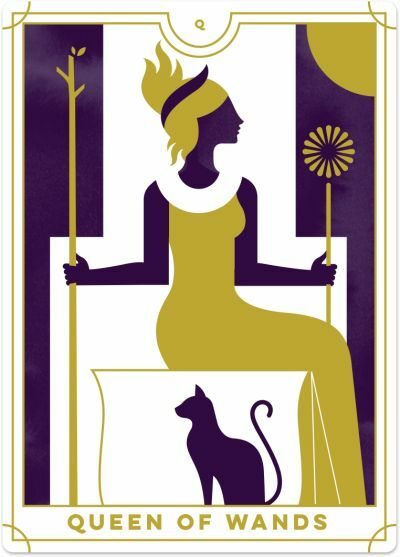 A black cat sits at her feet, a sign that while this Queen is bold and outgoing she is also in touch with her shadow self – the darker, lesser-known side of her being. The Queen of Wands reminds you that you are upbeat, courageous, and determined. You are here to see through your creative visions and life purpose, even in the face of adversity and challenge. Highly self-actualised and self-aware, you know how to best channel your strengths and weaknesses to achieve your goals. You are optimistic and full of ideas to share with others. You know what you want and how to get it, and are masterful at engaging with others to achieve your goals. Stay fiercely determined and focused on your goals while being friendly and optimistic with those around you. The Queen of Wands asks you to be bold in your undertakings and actions. Don’t be afraid to own your real power and put it out into the world. You have so much to offer – so shine your light bright! Believe in yourself and what you stand for, and don't be afraid to speak up and be heard. No one will silence you. Ever the social butterfly, the Queen of Wands suggests that you lead a busy life, making connections with others and putting yourself out there as you pursue your creative vision. You radiate health and vitality, and your inner vibrancy fills you with energy and inspiration – a natural-born, intelligent leader who actively inspires others. You can be quite the ‘mover and shaker,’ influencing others through your vision, courage and determination. You instil confidence in others, and you give them the power and self-assurance that they can achieve anything they set their mind to. The Queen of Wands also shows you are expressing yourself fully in your external world and enjoy being the centre of attention. You create a powerful first impression and can quickly win others over with your sweet, warm and charming nature. Now is the perfect time to put yourself out there and meet new people or create a community of like-minded people. They will be drawn in by your energy, passion and enthusiasm, and together you can create positive change in the world. 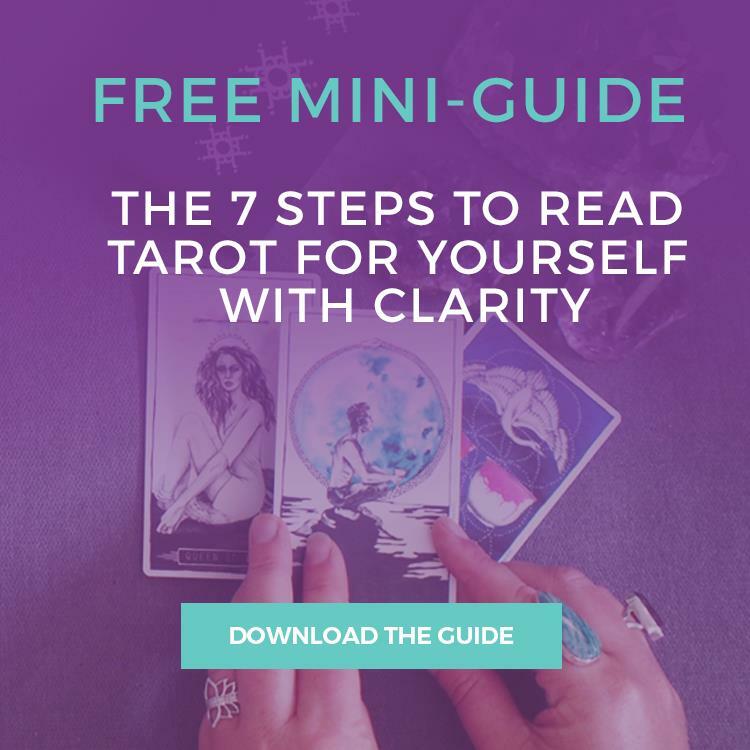 Finally, the Queen of Wands encourages you to get to know your shadow self, the lesser-known and sometimes darker side of who you really are. This doesn’t necessarily need to be a negative aspect of yourself, but could be something that most people don’t know about you… yet! It may be your dark sense of humour, a secret life from your past, or a passion project you’ve kept hidden away. While you may want to protect this part of yourself, the Queen of Wands encourages you to express this side more openly with others – don’t be afraid to show your shadow now and then. It will enable you to connect with others on a deeper level. The Queen of Wands reversed shows you have reached a place of self-respect and confidence. You know yourself on a deep level, and you are clear on your personal truth and belief systems. You know what you stand for you and you are not easily moved by the opinions of others. You have also defined what success means to you, even if it differs from others' definitions. The Queen of Wands reversed can also suggest that you may be more introverted than usual. Instead of being the social butterfly and centre of attention, you prefer to linger on the sidelines and watch what is going on. That’s perfectly okay – honour your needs and feelings and don’t push yourself to be extroverted and ‘out there’ when you don’t want to be. You may also feel called to spend more time alone so you can connect with your inner self and hear your inner voice. If you have lacked in confidence, the Queen of Wands reversed invites you to bring your energy and attention inward and focus on rebuilding your sense of self and your resilience. You may have handed your power over to others by paying too much attention to their thoughts and opinions. Now, you need to bring your awareness inward, so you can hear yourself and access your personal strengths and talents. Discover who you are and be courageous in expressing ‘you’ in everything you do, even if it is different from what others expect of you.